Why Start Using E-mail Marketing? Small business owners today have to do more with less. The internet has brought both new competition and new ways to market their businesses. Choosing which marketing channels to use can be tough. There is one channel however that consistently delivers high value in every industry; e-mail marketing. E-mail marketings has the highest ROI of any online advertising channel. Every dollar spent on e-mail marketing generates an average of $38 in sales. E-mail is 40 times more effective at acquiring new customers than Facebook or Twitter. Roughly 7 out of 10 consumers list e-mail marketing as their preferred way to communicate with brands. Over 70% of business owners are planning on spending more time on e-mail marketing and over 80% plan on spending more money! Creating a custom e-mail marketing campaign can seem like a daunting task. You need to build a list of subscribers, store that list on a spreadsheet, design the look of your e-mail, create custom graphics and manage un-subscriptions. All while trying to stay within anti-spam laws. Fortunately e-mail marketing tools like MailChimp and Constant Contact have taken much of the legwork out of creating beautiful and effective e-mail campaigns. You no longer need to manage your e-mail lists or be proficient in coding. MailChimp and Constant Contact are two of the biggest e-mail marketing tool providers. E-mail marketing tools have made marketing your business by e-mail easier and more powerful than ever before. No matter which tool you decide to use this guide will show you how you can set up your e-mail campaigns for success. As with any marketing effort, the first step in an e-mail marketing campaign is planning. The first thing you need to think of is the objective of your new campaign. Your objective is the action that you want your consumers to take, such as reading your new blog post or purchasing a certain product or service. Without an end goal it’s hard for those working on the project to know whether or not they’re doing the right things. Once you have your objective in mind you need to think of who you want to market to. Develop a unique consumer profile for each objective that you come up with. Are they existing customers or leads? Which products or services are they interested in? Write down the profile of your ideal consumer for each objective. Lastly you need to build an offer that will excite your ideal consumer into completing your objective. This could be anything from a special discount to a free piece of content to an exclusive contest. Now that you know who you’re marketing to, how you’re marketing to them and why it’s time to start building your e-mail list. The backbone of any good e-mail marketing effort is a good e-mail list. While there are many ways to build up your e-mail list, for this article we will focus on the one that consistently delivers the best results; opt-in forms. An opt-in form is a form on your website where consumers submit their name and e-mail address in exchange for an offer. Offers range from special offers or coupons, free pieces of downloadable content or simply receiving e-mail newsletters. Opt-in forms can be as simple as a short from asking for a name and e-mail address added into footer of your website or as complex as a custom designed landing page built around a special offer or promotion. All major e-mail marketing tool provide customizable opt-in forms that can either be hosted on one of their URLs or embedded directly into your website. 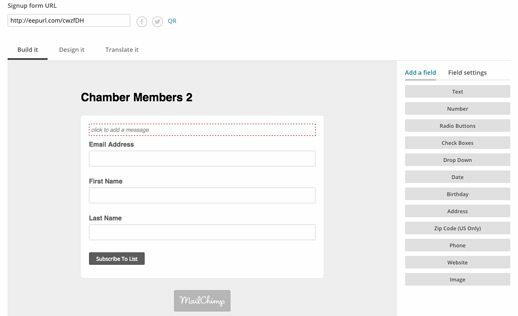 MailChimp, for instance, has a custom form builder that allows you to design your own opt-in forms. E-mail marketing tools like MailChimp allow you to build your own opt-in forms to grow your e-mail list quickly. When building your opt-in form make sure to only include the form fields that you need. The more fields you ask consumers to fill out, the fewer sign ups you will get. Consumers have become wary of online scams and are hesitant to give away too much of their personal information. The more information you ask for, the less likely they are to give it to you. In most cases all you need is their first name and e-mail address. The Canadian Anti Spam Law (CASL) is anti spam legislation that passed in 2014 and is designed to protect consumers from spam mail. CASL outlines the rules and regulations that businesses must follow when e-mail consumers. E-mail marketing tools help ensure that your e-mails meet CASL rules. This includes adding opt-out links in every e-mail and ensuring that consumers who opt out are removed from your list. It is important that you follow these rules when building your e-mail lists to avoid government fines. 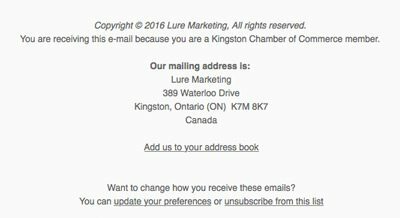 E-mail marketing tools take care of many CASL regulations, like including your mailing address and an unsubscribe link in your e-mails. Leads for a particular product or service. Customers who haven’t purchased anything in awhile. By splitting your list in this way you are able to send much more targeted e-mails. For example you can send your lead list a series of e-mails demonstrating the value of a product and offering them a special coupon or promotion. At the same time you can send your weekly news and updates to your newsletter subscribers. 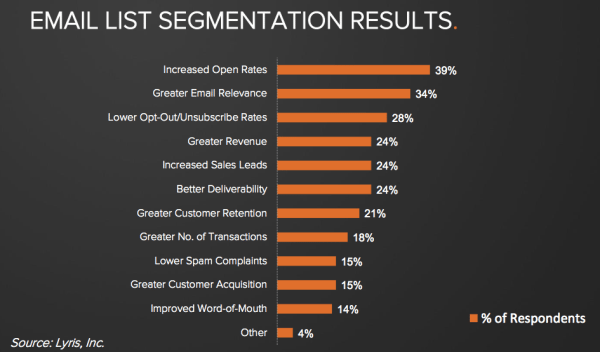 Segmented e-mail lists outperform un-segmented lists in every way. Graphic by Lyris Inc. If you don’t segment your list you lose this flexibility and your campaign will suffer. When consumers don’t get relevant e-mails they will quickly start to ignore them or send them to the spam folder. Someone interested in purchasing a product may not want weekly updates of your blog posts. Likewise, someone interested in receiving weekly updates might find the product-specific e-mails too pushy. Now that you have a plan in place and a list of recipients, it’s time to start crafting a compelling e-mail. Consumers are inundated with e-mails every day. For your e-mail to get noticed it needs to have a great subject line. Keep it brief (under 50 characters is best) and make sure that it highlights the main benefit of your offering to the consumer. It is also important that you keep CAN-SPAM rules in mind when creating your subject line. Your subject line should clearly indicate to the consumer what your e-mail is about. Ensure that it is in no way misleading. Not only will this help you avoid fines, it will improve your campaign’s performance. A misleading subject line may get a ton of opens but few consumers will read the e-mail body once they realize it is unrelated to the subject line. With your subject line out of the way it’s time to turn to the body. Your body should be a continuation of your subject line. If you promise something in the headline that doesn’t appear in the body you will lose the attention of your consumers and may even be flagged as spam. The average attention span of a human is now thought to be around 8 seconds. This means that you have a very short window to get them excited about your offer. Keep your message brief and demonstrate the benefits of your offer right away if possible. Include a call to action (CTA) to compel them into completing your objective. Generic CTAs like “shop now” or “learn more” should be avoided in favour CTAs that relate directly to your objective like “Get your ‘product x’ here” or “Sign up for our course on ‘x’ here”. If you end up with a long body and can’t reduce it than make it easy for the consumer to quickly scan. Highlight your key points by bolding the text or placing them in bullet points. This allows the consumer to quickly pick out the most important parts of your e-mail. Adding bullet points or bolding certain text allows consumers to easily find the most important parts of your e-mail. A little personalization in e-mails can go a long way. Adding consumer names into either the subject line or body of your e-mail can make a difference. In fact, Campaign Monitor shows that adding a consumer’s first name in the subject line of an e-mail increased the open rate of that e-mail by 26%. E-mail marketing tools can take care of this for you as well. Most include functions to automatically add in the name of the consumer receiving the e-mail. These names are taken from your e-mail list. This is why it is always a good idea to get first names as well as e-mail addresses. Now that you have the text of your e-mail complete it is time to add in a few images. 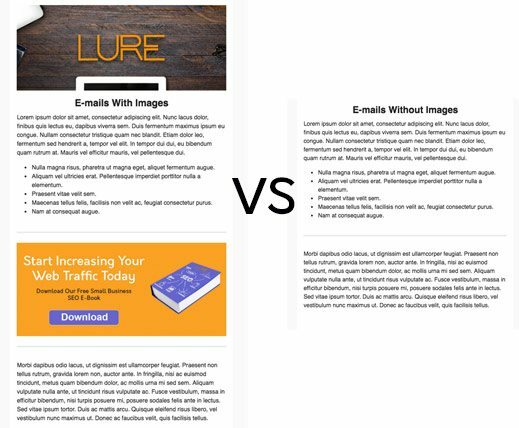 E-mails with images have higher click through rates than text-only e-mails. As with text though, sometimes less is more. According to Constant Contact, e-mails with 1-3 images have the highest click through rate. Choose images that fit in with the text of your e-mail and that help demonstrate the benefits of your offering. Images add a degree of professionalism to your e-mails and can also act as effective CTAs. Now that your e-mail is complete it’s time to hit send. Your campaign isn’t finished yet though. You now need to analyze the results of your efforts. The last step of any e-mail marketing campaign is to analyze its results. The point of this is to see what is worked and what didn’t. With this information you are able to improve the results of future e-mail marketing efforts. Most e-mail services providers include analytics tools as part of their services. These analytics tools can be extremely detailed with many different metrics available for scrutiny. Today we will focus on the three most important metrics you should be tracking: open rate, unsubscribe rate and click through rate. 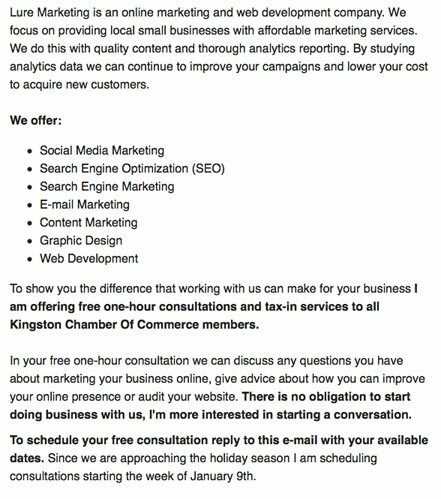 E-mail marketing tools like MailChimp include detailed analytics reports so you can accurately judge the success of your marketing campaigns. The open rate is the percentage of consumers that opened you e-mail. A low open rate means that most consumers deleted your e-mail without reading it. If this is the case you either didn’t segment your lists properly or your subject line wasn’t compelling. The unsubscribe rate is the percentage of consumers that opted out of your e-mail list. A high unsubscribe rate means that your consumers decided that your e-mails are no longer worth getting. This could be down to poor list segmentation, poor content or simply from sending too many e-mails. Click through rate (CTR) is the percentage of e-mails where a consumer clicked on a web link. A low CTR is usually down to either poor e-mail copy, copy that didn’t match the subject line or a less than desirable offer. As you can see there are many reasons why e-mail marketing campaigns can either succeed or fall short. Now that we better understand how well our campaign performed, how can we better understand why it performed the way they did? The answer is A/B testing, also known as split testing. A/B testing is the practice of creating and publishing two versions of an advertisement. These two versions are identical with the exception of one variable. The two versions are then tested against each other to see which version consumers prefer. This knowledge is then used for future campaigns. In e-mail marketing there are three variables you should consider A/B testing. These variables are the subject line, content and send time of the e-mail. Along with the “From:” field, the subject line is the biggest factor in determining whether or not a consumer will open your e-mail. When consumers don’t open your e-mails it doesn’t matter how good the content is. If your e-mail marketing campaigns suffer from low open rates begin testing different subject lines. If you’re already getting great open rates but your CTR is low then consider testing the content of your e-mail. You don’t want to completely rewrite the body of the e-mail however. Only change one or two key parts of the e-mail. You could, for instance, try different images or change your call to action. If you change too many things it becomes hard to tell what change influenced your results. E-mail send times are another factor that can influence your success. As this infographic from Smart Insights shows, both the day and time that you send e-mails can affect both the open rate and conversion rate you achieve. Once you think you’ve got your subject lines and body down, try experimenting with send times to see if you can squeeze some more value out of your e-mail marketing efforts. Using your e-mail tool the split testing process is simple. When creating your campaign simply choose to create an A/B test, pick the variable you want to test and what metric you want to judge success. Everything else is done for you. No two lists of consumers will react the same way to a marketing message. Using analytics and split testing together allows you see what works and what doesn’t. 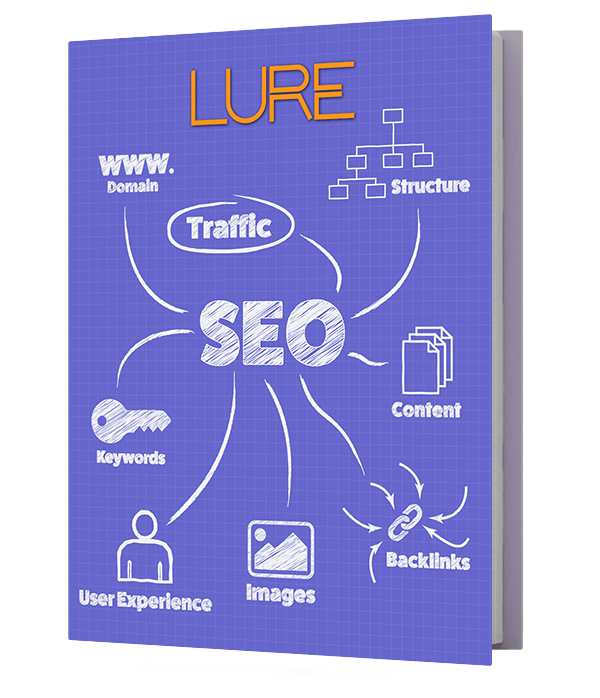 With this knowledge your e-mail marketing efforts will only continue to improve! With enough knowledge and the right tools, e-mail marketing can easily become your business’ top performing marketing channel. Whether you choose to do it yourself or have it managed by a professional marketing company, e-mail marketing is a must for any small business. So what do you think about e-mail marketing tools? Have you tried any in the past? What did you think? Let us know in the comments below! For more e-mail marketing statistics see our infographic about why you should take advantage of e-mail marketing.